There were many reasons to run conservatively in contrast to the pedal-to-the-metal tactics I employed the last times I ran two marathons in a weekend. 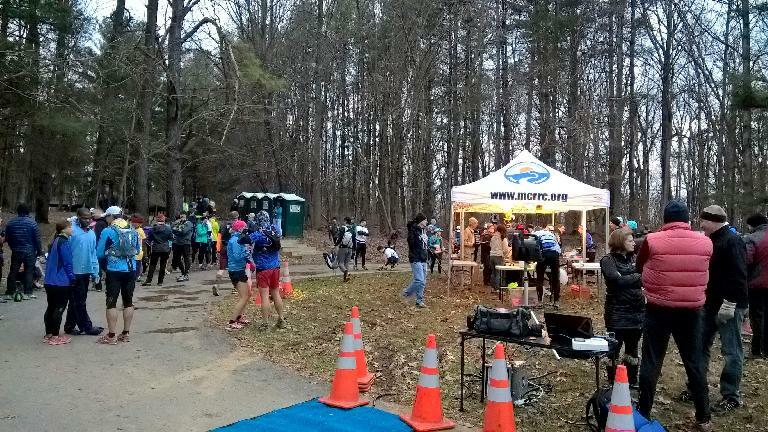 I had undertrained, the terrain would be hilly, the course was almost exclusively narrow dirt paths instead of speedier roads, the temperatures would hardly be above freezing, and the race was advertised as a no-frills, bring-your-own-bottle sort of deal. But there was another. Maureen would later ask me if this race was technically an ultra-marathon, then. “Seems like it to me,” I said. Those extra two miles, I knew, could be significant. There already were numerous times during marathons (usually while bonking) when I cursed the International Amateur Athletic Federation (IAAF) for changing the modern marathon standard from 24.85 to 26.22 miles. So I started about a third from the front of the field of 130 even though this meant that I would be bunched up behind other runners once the race converged onto rolling singletrack after the first mile. At this position the field was advancing at a 10-11 minute per mile pace, including walking up some hills. That was good enough for me. The line of runners started to get more strung out by about Mile 7 as the trails got muddier and there were stream crossings. 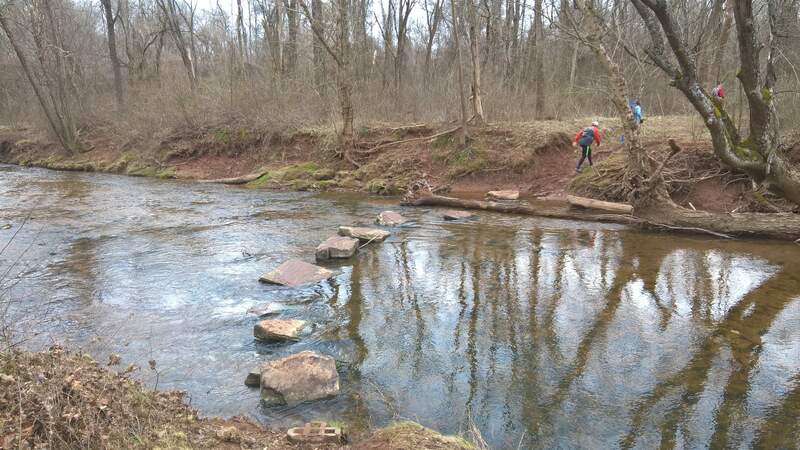 There was one point where we had to hop across seven evenly spaced boulders to cross what must have been the namesake of this run, the Seneca Creek. Other streams required only the forward leap of a long jumper, or—as I became more inclined to do once my feet were wet anyhow—slog though the ankle deep water and mud. Moisture and sticky, soft dirt were actually some of the less daunting elements of this run. I became aware of this when a woman tripped a couple feet in front of me and and her whole body hurled to the left side of the trail. She was ok, but it took her a little while to stand on two feet again. The issue was the so-called greenway was actually tree roots galore. Not long after, I took my first stumble. A root caught my right foot and for a few seconds my forward velocity surely approached 20 miles per hour. As I fought to keep my legs underneath me, my legs churned over like an eggbeater while my shoes stomped on the ground like an angry man. “Nice recovery,” said a runner behind who had witnessed the brief moment of drama. This actually happened a couple more times until around Mile 21 in the race, a few miles after competitive instincts started taking hold and I picked up the pace enough to catch and pass runners with regularity. This is when my right foot slammed against another root, causing me to launch forward, touch down on my left side, do a 360-degree roll, and pop right back up and keep on running like I was some sort of ninja master. A few miles after that I fell yet again, right after I passed a cameraman shooting photos. (Fortunately for me—but maybe unfortunately for the photographer—it did not happen two seconds earlier or else he could have gotten a either a highly awkward or comical action shot.) This time I careened towards the earth too quickly to initiate any twisting girations or sideways sommersaults. I only saved myself from completely planting my face onto the dirt by falling squarely onto my gloved hands. Then I did something like a dynamic pushup, sprung upwards and then kept on going, which I reckon made me resemble a frog. I took one more fall, but my rise back to life after this one was, alas, more wounded soldier than video game-like. Actually, I was on the ground for only two or three seconds, but the resultant knee scrapes and bruises had me pronouncedly limping for a minute or two. All in all, I tripped eight times, falling three. One reason I was kept catching a toe on roots was my legs were starting to get fatigued and I was not picking up my feet enough. The quads and hamstrings were sore enough that I no longer had much trailing leg extension or flexion. At Mile 25 my left calf even started to cramp, but I was able to work through it without a significant reduction in speed. A mile later, I could hear a lot of cheering, indicating that volunteers and the final aid station was near. “How much farther for the marathon?” I shouted as I decided to bypass the station as I figured I did not need any more food or liquid at this point. “About three, I think,” someone replied. “Oh boy,” I said, followed by some people’s laughter. I was hoping for less than two. “Turn this way and the finish is in 100 yards,” the volunteer advised while pointing to my left. “REALLY?” I said, commencing a sprint. Done! At the post-race picnic area, there was plenty of chocolate milk, fruit, tomato and potato soups, meaty sandwiches (some made with croissants), chocolate cookies and even a whole chocolate cake to fill empty bellies. 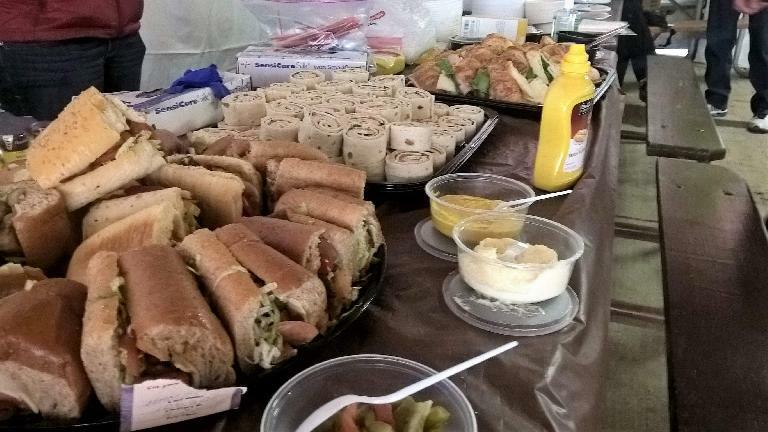 The aid stations, generally placed every 3-6 miles, were also generously stocked with water, Gatorade, Coke, pretzels, and peanut butter and jelly sandwiches. So much for this being a no-frills event. Kudos to the Montgomery County Road Runners Club for the well-marked course and excellent organization of a race that turned out to be literally more than a marathon.